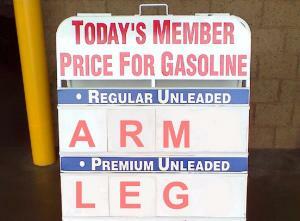 There doesn't seem to be a week that goes by without our local news doing some kind of story or focus on gas prices. Recently, I watched a story about how the prices in our area have shot up a pretty hefty amount fairly quickly. And while we, the consumers, really don't have any immediate control over the price we pay at the pump, there are some tips we can employ to help us save on filling up our cars. This one's an easy one. In any given area, there are usually at least a handful of sites on the web that showcase local gas prices. Use these. I think sometimes we tend to stick with the same gas stations on our normal, same routes because they're easy (no? okay, maybe that's just me). A little looking around could shave a few pennies off the cost of a gallon, and it really requires not much more effort on your part than a few clicks of the mouse. One such site to get you started: gasbuddy.com. To take your potential savings one step further, you'll need to think about the stations in your area and do some homework to see if they offer up any savings to their customers. For example, a local grocery store chain has a program in which for each dollar you spend at their grocery store, you accumulate one gas point. 100 of these points equals a ten cent discount at one of their gas stations. To make the incentive even sweeter, they will also give out ten points for each manufacturer coupon redeemed and also periodically run specials to gain an even greater number of points (like buy six items in one transaction, get 200 points automatically). While you might be thinking ten cents isn't much, it is something; plus, in the past, I've been able to utilize coupons and store specials to get over a dollar off per gallon at the pump. Trust me, that definitely helps. If your local grocery store isn't hooked up with a gas station and doesn't offer a similar program, don't lose heart. Another chain of gas stations in our area offers a discount card in which a certain number of fill-ups at the pump nets you a certain amount off your next fill up. And of course, a number of them offer their own kinds of credit cards enabling those who use them to pay a lower price than those who don't. Also, if you belong to one of those mega-warehouse shopping clubs, check out the gas price at their sister gas station. Often, the price is one of the cheapest around, and usually you can fill up there as a perk for being a member. My point is, there are savings to be had at the pump. It might take a bit of homework and digging and configuring on your part, but they are there. And hey, any little bit helps, right? What about you, MomVesting readers? What kinds of things do you do to save at the pump?